The Federation are capable of science that can substantially alter or even destroy stellar bodies. Using the same science it is possible to alter ships to destroy them if shields aren't in the way - in the same way a rebel base could be entirely eradicated using a supernova or terraforming device. The Genesis device, although somewhat unstable, is supposed to turn a barren world into a living one. However, this is not all it can do. As seen in Star Trek II and III, it actually rearranges the molecules of a Starship and a nebula into a planet. This is a technical and scientific feat beyond anything in Star Wars. The Federation has the ability to destroy whole stars. The Federation have the ability to re-ignite dead stars. This is explored (unsuccessfully) in a 'The Next Generation' episode, and successfully in 'Deep Space 9: Second Sight'. This is an ability beyond anything the Rebels (or Empire) demonstrate on screen. 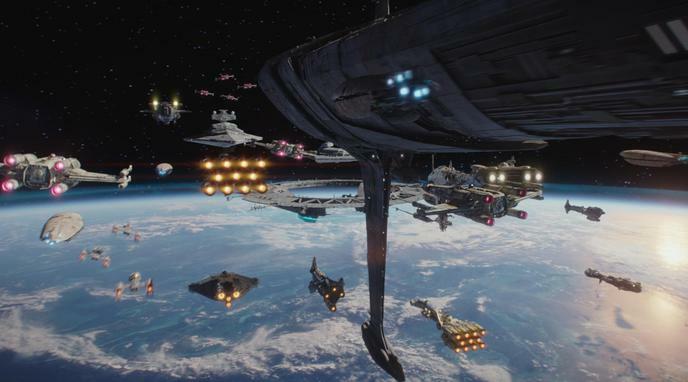 Space battles are about destroying ships, not stars.